Since parsing a delimited string and using the values of a delimited items is a common task in T-SQL, it is a good idea to create a T-SQL Function that will do the work of parsing the delimited string and then return the values in a Table. Once the Function is created, you can call the Function from a Stored Procedure, Query, or whatever else can call a Function. For our example, imagine you have a Table of Users. Where the table consists of the Columns: FirstName, LastName, EmailAddress, and ReceiveNewsletter. Our imaginary application has a feature that will send out monthly newsletters to users that would like to receive the monthly newsletters. To keep track of whether or not a user would like to receive the newsletter, we have a column in the Users table that accepts a bit value (True/False). Now imagine the scenario where you want to create a Store Procedure that will update the ReceiveNewsletter column for multiple users using only one UPDATE statement. To do this we will create a sproc that receives a delimited list of UserId’s and a True/False value that specifies whether or not the specified UserId’s want to receive the newsletter or not. (Assuming that the caller of the sproc sent “1,2,3” as the @ids value. To work around this limitation, we will create a Function that does the work of parsing the delimited list of ids and then return the values in a Table. The caller of the Function can then simply SELECT the values from the returned table. -- The caller of the sproc will send a delimited list of MyTable ID's such as "1,23,456,789"
Using Microsoft SQL Server Management Studio, this post will show you how to create the Function that will return a Table that consists of one column (named “Numbers”). The values/records of the “Numbers” column will consist of integer values that were parsed from a delimited string. -- If a delimiter exists in the string/list, then get the value to the left of the delimter. Now, we will create a Stored Procedure that will update the Users table. Specifically, we will create a sproc that will SET the “ReceiveNewsletter” column to ‘TRUE’ or ‘FALSE’ for records that have a matching UserId value that exists in a delimited string. @Delimiter NVARCHAR(1) = ',', -- The caller can specify what the delimiter is. The default delimiter is a comma. @ReceiveNewsletter bit = 'FALSE' -- The caller can specify 'TRUE' or 'FALSE' as the value that will update the records. Default is 'FALSE'. Since T-SQL doesn’t parse a delimited string when using the IN clause in a T-SQL statement, we need to first parse the values out of the delimited string variable then add those values to a T-SQL Table. Then, we can use that Table to select the values within our statement. And since this is a common problem when SELECT’ing, UPDATE’ing, etc, we built a function that does the work of parsing the delimited string and adding those values to a Table. Callers of the Function simply have to pass the delimited string to the Function then work off of the returned Table. If you are interested in learning more about working with lists and arrays in SQL Server, do yourself a favor and check out what Erland Sommarskog has to say. 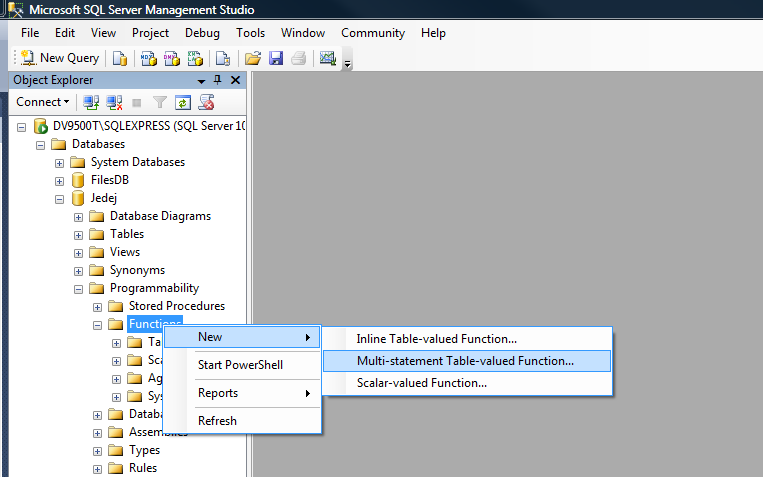 Manually adding (inserting) a NULL value to a table in the SQL Server Management Studio requires that you enter Cntrl+0 in the field/column. Note that the initial value of @myString was “[ABC”. I was expecting the first IF condition to return FALSE since @myString IS LIKE the expression ‘[%’. However, you’ll notice that the final output is “[[ABC”. Which means the first IF condition returned TRUE. Why? Any single character within the specified range ([a-f]) or set ([abcdef]). For more information on the bracket wildcard, go here. Since the brackets are wildcards for the LIKE Operator, I needed to ESCAPE the bracket characters so that T-SQL would treat them as regular text. For more information on SQL Escape, go here. -- Description:	Returns one or more user records from the Users table. -- This sproc allows clients to have to make only one call to retrieve more than one record from a table (as opposed to calling the sproc for each record). -- The parameter is a varchar that can be a comma delimited list of UserId's. -- Declare the SP Parameter. Thanks to Erland Sommarskog for this solution.